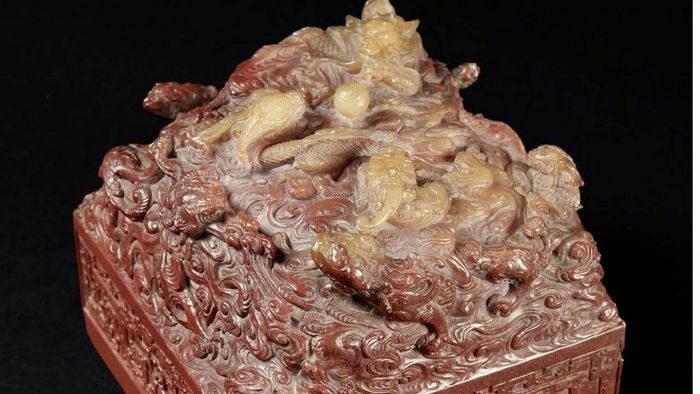 An 18th-century Chinese imperial seal sold for a record 21 million euros (US$22 million) in Paris on Wednesday - more than 20 times its estimate, the Drouot auction house said. Decorated with stylised dragons, the symbol of imperial authority, the extremely rare stamp in red and beige nephrite jade comes from the Qianlong period (1736-1795). It was snapped up by an unnamed Chinese collector after a furious bidding battle between would-be telephone buyers and those in the salesroom. The previous record for a seal had been set in 2011 when one was bought for 12.4 million euros (about US$17.4 million at the time). The Chinese imperial seal, remarkable for being “very red, almost blood” red according to Asian art expert Alice Jossaume, had been expected to sell for between 800,000 and one million euros. It belonged to the Emperor Qianlong, who is regarded as the longest serving emperor in Chinese history, holding ultimate power long after he officially retired. “The Qianlong period is highly prized, it’s flourishing, it’s the absolute pinnacle,” added Jossaume. Under this hugely capable and cultured emperor, the Qing dynasty reached its apogee of wealth and power, almost doubling in size during his six decade reign. The nine dragons that decorate the seal’s sides symbolise both his masculine power and imperial authority, the auction house said. The emperor was known to be a talented calligrapher and poet and this seal was one he used to sign his works. Qianlong’s reputation was one of a protector of the arts and literature, as well as a compulsive collector. He is said to have acquired one of the biggest world art collections and founded the library of four treasures, the largest collection of books in Chinese history. The empire’s population rose to some 400 million people as he expanded its borders, but by the end of Qianlong’s long reign China was slipping into slow decline. Still, the Qing dynasty, which came from the Manchu minority from Manchuria in northern China, staggered on until 1912. The seal was acquired by a young French naval doctor in China in the late 19th century and has remained in the same family since. According to Drouot, the young officer visited China many times and built an impressive collection through his “taste, culture and the friendships he was able to build up over the years”. Two paintings by the Japanese master Katsushika Hokusai - “36 Views of Mount Fuji” and “Great Wave at Kanagawa” - from the same collection were also going under the hammer with estimates of £30,000 euros ($32,000).